Fourth Fridays are artistic happenings and cultural events that take place at different locations in Guelph every fourth Friday of the month. Events are organized around the city for people of all ages to come together in the celebration of the creative, neighbourly, interesting and welcoming vibe of the City of Guelph. Come, join the crawl, and discover the secret corners and receive new inspiration while participating in the unique creativity and community of Guelph! 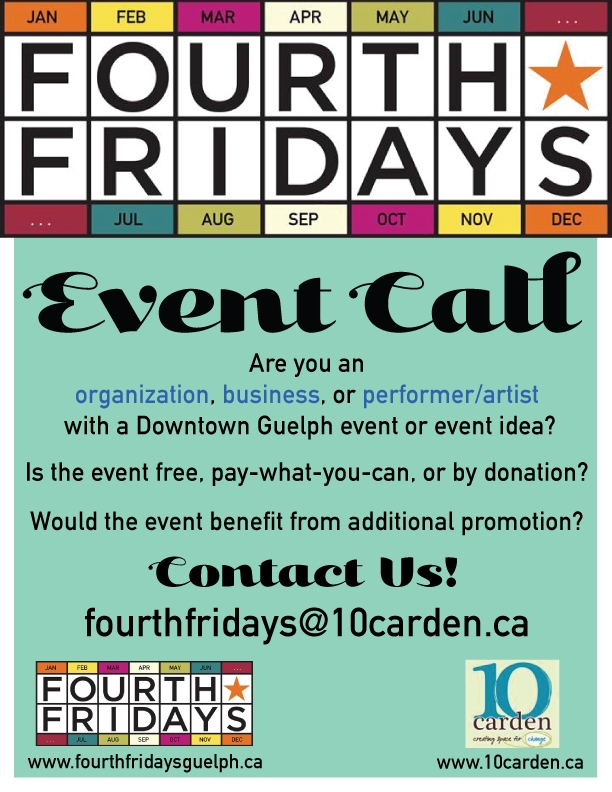 *Please note: To encourage participation in Fourth Fridays and to make it an accessible event series, it is recommended that events are free or Pay-What-You-Can (PWYC)/ by donation. We’re on social media y’all! ‘Like’ our Facebook page and find our events at https://www.facebook.com/FourthFridaysGuelph/. This entry was posted in Art, Dance, Fourth Fridays, Literature, Music, Performance, Workshop and tagged downtown Guelph events, event promotion Guelph, Fourth Friday's events, Guelph events by Fourth Friday. Bookmark the permalink.